Online dew point measurement combined with pressure measurement provides an excellent assessment of the condition of the SF6 insulation. Sudden and minor leakages are immediately detected by the direct normalized pressure measurement, while online dew point measurement alerts the user to moisture issues, which can weaken the insulation properties of SF6 and cause rapid deterioration. With the DPT145, it is also easy to build a redundant solution for multiple parameters. A single transmitter, instead of several, saves time and money across the board, from investment to installation, operation and servicing. Lower assembly costs, fewer cables and connectors, minimized need for on-site visits and field operations - all these translate into cumulative savings. The long calibration interval results in further savings. Online measurement enables gas trends to be followed via a data collection system, making monitoring fast, risk-free, and accurate. Using one instrument for monitoring seven different parameters means also fewer mechanical connections and reduces the risk of leaks. Monitoring is environmentally friendly because there is no need for sampling - no SF6 gas is released into the atmosphere. Vaisala has over 70 years of extensive measurement experience and knowledge. The DPT145 brings together the proven DRYCAP® dew point sensor technology and BAROCAP® pressure sensor technology in one package, providing an innovative and convenient solution for monitoring SF6 gas. 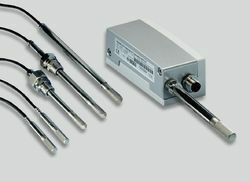 The HMT310 incorporates the latest generation Vaisala HUMICAP® Sensor. The Vaisala HUMICAP® Sensor is a capacitive thin-film polymer sensor. It features high accuracy, excellent long-term stability and negligible hysteresis. It is insensitive to dust, particulate dirt and most chemicals. The HMT310 is powered up with 12 ... 35 VDC. It has two analog outputs and an RS-232 serial output. The output signal and the supply power travel in the same cable, the only cable connected to the unit. 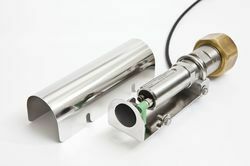 Chemical purge helps to maintain measurement accuracy between calibraton intervals and it involves heating the sensor to remove harmful chemicals. The function can be initiated manually or programmed to occur at set intervals. * chemical purge for applications risking an interference with chemicals in the measuring environment.